The Alliance Funding Group’s 20 Year Celebration was such a spectacular Event. What could be better than an evening on the beach barefoot with music, food, and smiling faces? My team and I were excited that the venue was Sea Legs at The Beach! I am so proud of the work my team put into this event. We wanted to go big for this important 20 year celebration. Right at the entryway sat large white abstract inflatables. We decorated the stage in golden and white fans. At night the white floor lit up pink. For this occasion the centerpieces needed to pop! We filled gold and teal vases, with bright orange, purple, and fuchsia flowers. An exotic variety of flowers could be found in modern vessels on top of white tabletops around the venue. 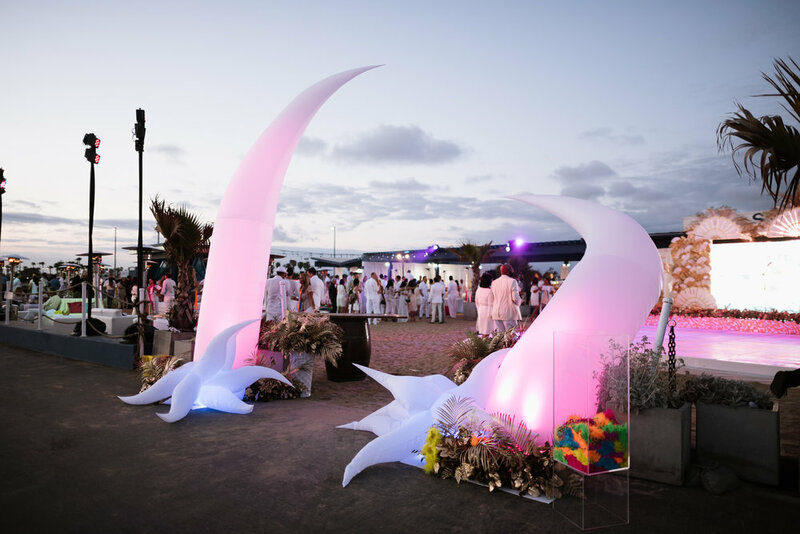 In addition to the sleek white tables the team organized a series of white cushion ottomans along the sandy venue. The ottomans were decorated with bright sequin pillows in pink, orange, gold and blue to match the flowers. 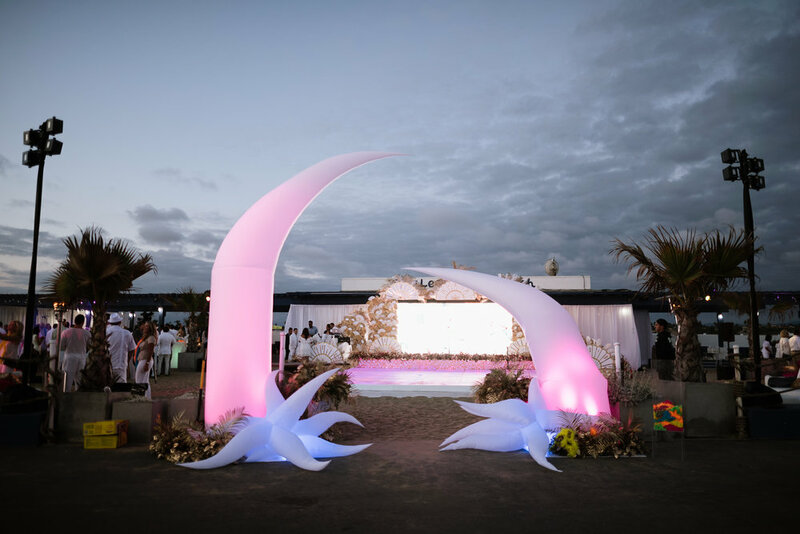 We added golden trays of flowers onto soft white cabana beds to tie the scene together. The Cigar Bar held a different vibe than the rest of the party. Although similar flower arrangements remained consistent, a leather couch accompanied barrels, with green accent brushery to create a rustic feeling. The wood tables and the large moss sign really tied the bar all together.